In a small bowl, whisk the flours, baking powder, and salt together. In a mixing bowl, beat the eggs and sugar with an electric mixer until light. Add the creamer, rum and vanilla and beat another 3 minutes. with the mixer on low speed, gradually add the flour mixture. Fold in ¼ cup of the coconut. Liberally grease an 11-inch frying pan or pie pan. Arrange the nectarines in a circular pattern on the bottom. Pour in the batter. Bake for about 40 to 50 minutes or until the edges puff up and the top browns. 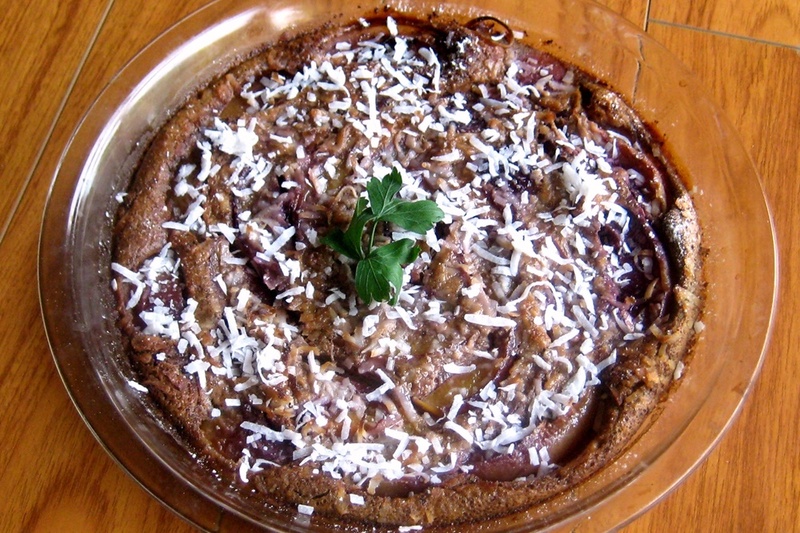 Sprinkle the nectarine clafoutis with the powdered sugar and remaining 2 tablespoons of coconut. Best served warm. Firm nectarines will provide some tartness to cut through and balance this very rich batter, making it truly delectable!